Free Scenarios Eleven Through Fifteen! We continue our list of the most requested (as voted by you) scenarios with numbers eleven through fifteen. These scenarios will be included as a reward to General Staff Kickstarter backers. For more information about when the Kickstarter campaign will begin see this page. After the Kickstarter campaign they will be available as digital download content. Scenarios number 12 and 13 are excellent examples of the flexibility of the General Staff Wargaming System. In the Little Bighorn with Gatling Guns scenario we can use the built in ability to modify unit speeds (see this video) to modify the horse artillery speed to properly reflect that “condemned cavalry horses” that pulled the guns. In the Isandlwana scenario we can use the built in ability to modify the attack matrix to represent that the Zulu regiments were armed with assegai iron spears and cow-hide shields. 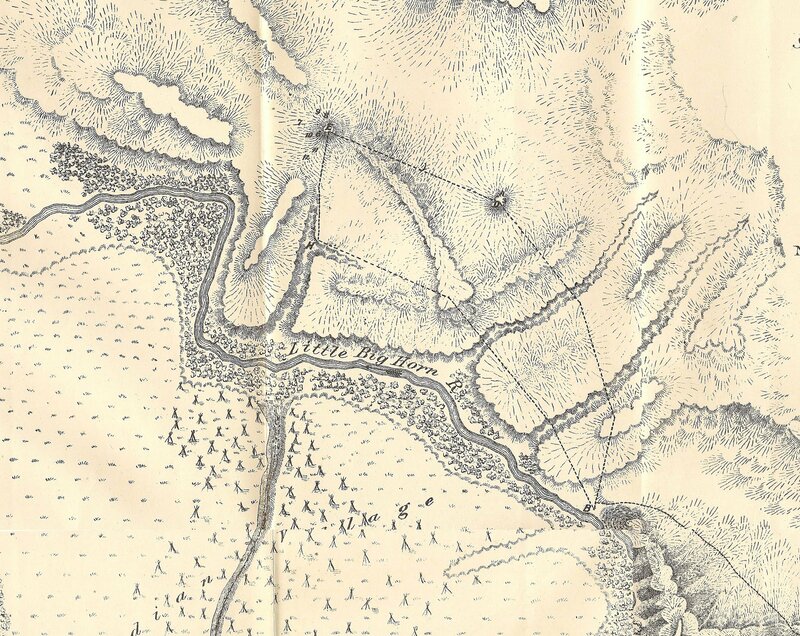 Map of the Battle of the Little Bighorn to accompany the report of Lieutenant Edward Maguire of the U.S. Army Corps of Engineers. Click to enlarge. After the original UMS (see here) was released a number of users created Little Bighorn scenarios that included Custer’s famous Gatling guns. 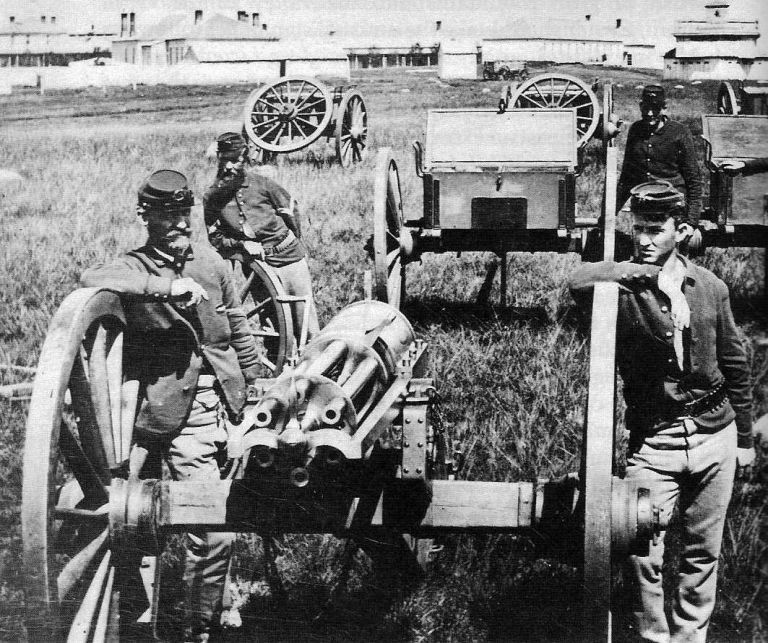 (For more information about Custer’s Gatling guns click here.) Custer, of course, refused to take the battery (either two or three guns) because he feared it would slow down his column. Instead, they traveled with Colonel John Gibbons’ column. In rejecting them, Custer wrote to his superior, General Terry, “The 7th can handle anything it meets.” Would they have made a difference? This should make for fascinating ‘what if’ simulation. Photo taken by F. Jay Haynes of one of the Gatling guns that were available to the 7th Cavalry. Click to enlarge. This map is from the Campbell Collection University of KwaZulu-Natal. We are working on getting a higher resolution image. We have recently written about using the General Staff Wargaming System to create a Battle of Isandlwana simulation. Properly modeling disparate unit types (e. g. British line infantry versus Zulu regiments) could be a daunting task but General Staff allows for modifying attack matrices to reflect different unit types, armament and abilities. 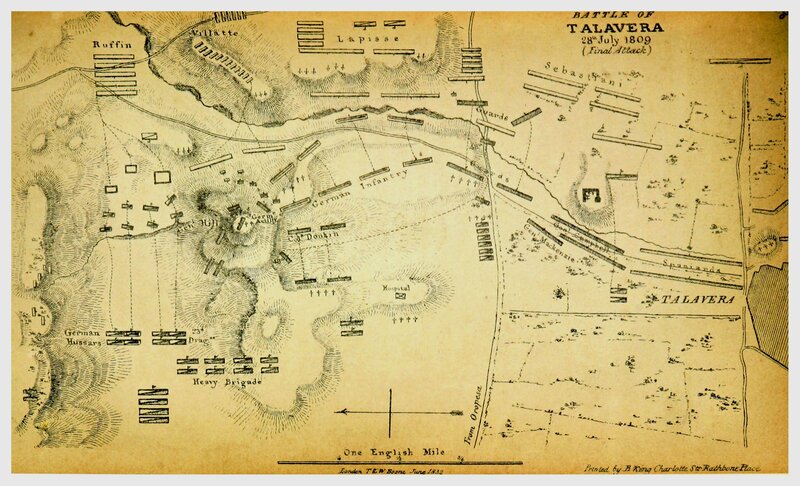 The battle of Talavera from page 273 of History of the King’s German Legion. [With plates. ], by BEAMISH, North Ludlow.. Original held and digitized by the British Library. Click to enlarge. The first of our Peninsular War battles is Talvera and pits Sir Arthur Wellesley (who will be elevated to the Peerage with the title Viscount Wellington after Talvera) against the French King of Spain, Joseph Bonaparte. 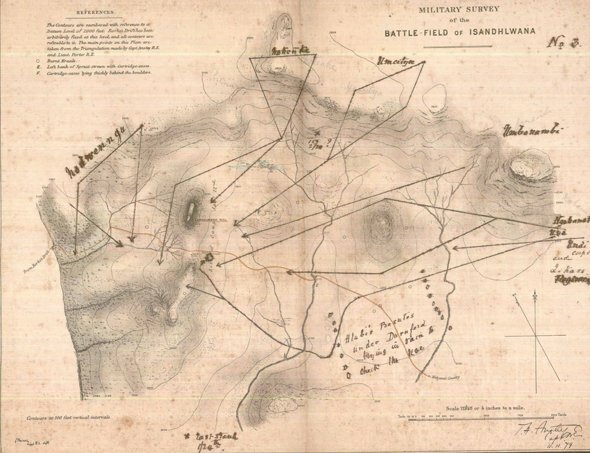 This is an especially interesting terrain where evenly matched armies fought where the British suffered approximately 25% casualties and the French 18%. Considered a tactical victory for the Anglo-Spanish. 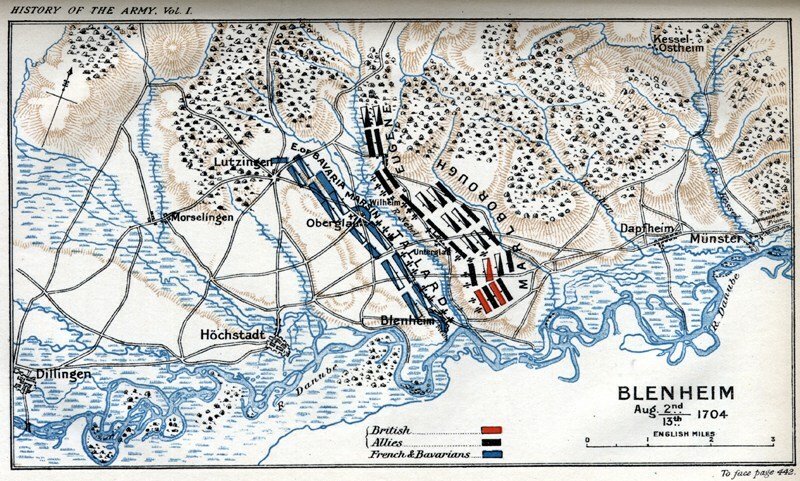 The Battle of Blenheim August 13, 1704. This entry was posted in Kickstarter, Scenarios and tagged Blenheim, Custer, Gatling Guns, Isandlwana, Little Bighorn, Talavera on August 30, 2017 by EzraSidran.